Michael E. Seamon was born August 11, 1956 to Frederick and Clara Seamon, in Hartford, CT. Mike is one of 4 boys, his brother Timothy resides with his family in North Carolina, his brother Stephen lives in New Hampshire with his wife, and his brother David resides in Moodus, CT. Mike discovered and met His older half-brother John Jacko and Linda Jacko his half-sister in 2018. Mike organized with the help of his Aunt Marlene Bailey a reunion and all the siblings and their families had a chance to get together. Mike's father, Fred, was a car salesman for Williams Ford in West Hartford and moved the family with some regularity. Michael attended various schools, all within Connecticut, and graduated from Glastonbury High School in 1974. Mike lettered in Football, and Indoor and Outdoor Track. In his senior year, Mike lost his Mother to cancer. In September of 1974 he enrolled in A.I. Prince Technical School in an Oil Heat Post Graduate course. After 1 year of a 2-year course, Mike was allowed by his teacher, Mr. Boris Lashenka, to take the final exam and pasted with score of 97. In 1975, Mike started his working life at Didato's Oil Service in Middletown, as a Serviceman. In 1976, Mike was married. In 1977, Mike's father died unexpectedly at the age of 46, and his two youngest brothers moved in with the newlyweds. In 1978, Mike was blessed with a son, Daniel F. Seamon. In 1978 Mike took a job with Comfort Facilities in Rocky Hill. He then returned to the oil business in 1979 at C.B. Stone in Middletown. In 1980 Mike was lured to the General Oil Company in E. Hartford, by Aaron Cook. Mike then moved his family to East Hartford. After 1 year, he began his Career at the East Hartford Housing Authority as a Maintenance Mechanic and served as the Union Executive Board Representative to AFSCME Local #1174, he held that position for 10 years until 1996, when he was promoted to Maintenance Supervisor. In 2000, he was made a Housing Inspector and performed all the public and Section 8 inspections until his retirement in 2007. After a short-lived retirement of 10 months, Mike took a job at Konover Commercial Property Management and presently works at 450 Columbus Boulevard in Hartford and other State owned properties. Mike's Masonic life started in 1990 when he was raised a Master Mason in Hartford Lodge #88, which met in Newington at that time. He immediately entered the line as Senior Steward and became Master in 1996, and again in 1999 and 2005. Mike's Lodge moved to Wethersfield, East Hartford and then to South Windsor where it merged with Oriental Evergreen Lodge #114 and is now known as Hartford Evergreen Lodge #88. Mike received the Master's Achievement Award twice and the Trestle Board of Excellence. He was one of the Masons who started the Child ID program, known as "CHip" in South Windsor. In 2005, as Master, he brought the "Chip" program into every Elementary School in South Windsor. Mike served as the District Deputy of Masonic District 6A and 6B in 2003 -2004, he is Past President of the 6th District Blue Lodge Council and Past President of the Past District Deputies Association. Mike has served on the Grand Lodge "Rules and Regulations Committee" and the "Strategic Planning Committee". He became a member of Scottish Rite in the Hartford Valley in 2004 and has taken various parts in many degrees, he is known for his portrayal of George Washington in the new 4th degree. Mike is a Past High Priest of Pythagoras Chapter #17 RAM and is presently serving a second term as High Priest. In 2018 the phone rang and Mike was asked by Grand High Priest James S. McNeely to fill a void in the Grand Chapter line, and is presently serving as the Grand Royal Arch Captain. He is a member of Wolcott Council #1 and is also presently serving a second term as TIM. He is a Past Commander of Washington Commandery #1. He received the Knight of Ish Sodi award from the Grand Council in 2010, and was asked by James Kleinkauf to join the Grand Council Line in 2010. He served as Most Puissant Grand Master in 2015. Mike is an officer in the "Knight of York Cross of Honor" in Stratford, he is also a Pillar in the "Holy Royal Arch Knight Templar Priests ". Mike is a Past Excellent Chief of "Mohawk Council of Knight Masons". 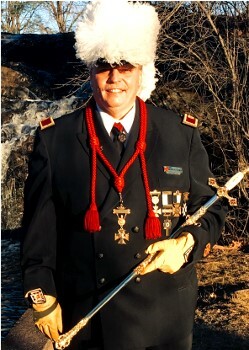 In 2011 he was asked by the REGC, Leonard Bucher, to join the Grand Commandery Line as the Grand Sentinel, and was shortly installed as the "Grand Inspector" and performed that duty for 3 years. In 2015 Mike received the "Knights Templar Cross of Honor" from the Grand Encampment of Knights Templar. Mike is an officer of Connecticut York Rite College #17. Mike is a communicant of St. Mary's Episcopal Church in Manchester and is active in the choir. Mike is an avid fisherman and hunter. In 1992 he received a trophy from the State of Vermont for having taken, that years largest buck. Mike enjoys spending as much time as possible with his 18-year-old Grandson Bryan Anthony. Mike met his Lady Linda in 2011, she has been his Love and Support in all his endeavors, traveling with him in and out of State for both his term as Most Puissant Grand Master and throughout the years as he has worked his way up the Grand Commandery Line. Linda's family has welcomed Mike with open arms into their family.